You can see list of our Mamy Poko Pants XXXL vs Teddyy Easy Baby L below, perform Side-by-Side comparison. If you need further help, do have a look at Conzumr Guides and Tips. Alternatively you can view all Diapers & Nappies to choose your own favourites. 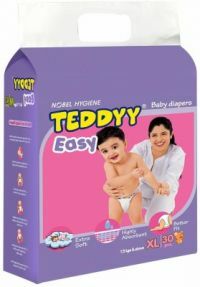 To Recieve updates and possible rewards for Teddy Teddyy Easy Baby Extra Large Size Diaper please sign in. To Recieve updates and possible rewards for Diapers & Nappies please sign in.